As you may be aware by now, we're all Halloween experts around here. We look for new Halloween trends and tricks to use year-round. We carve pumpkins in July so we can perfect our techniques in time for October's festivities. We have our costume selected for next year's celebration as soon as Halloween gets over. Since ghosts, ghouls, and all-things-spooky are always occupying our thoughts, a random but deep question popped into our brains: are all Jack-o-lanterns male? Impossible! Female Jack-o-lanterns need to be a thing and luckily this women's pumpkin off the shoulder tunic is a step in the right direction. 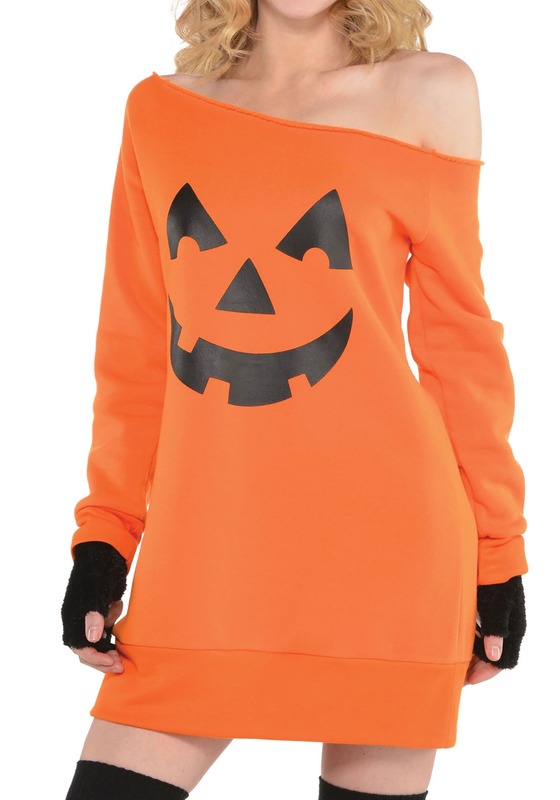 Exclusively for women, a Jill-o-lantern is featured on the front of the tunic. (A female Jack-o-lantern). How do we know? Well, like we said, we're Halloween experts and since this garment is solely for females, a female Jack-o-lantern (excuse us, Jill-o-lantern) is featured right on the front. Makes complete sense right? Perfect for parties and other fall festivities, the pumpkin tunic is a great way to show off your spooky spirit in a stylish yet festive way. Wear it for the whole month of October and let people know all about female Jack-o-lanterns. Soft, comfortable and fashionable, the women's pumpkin off the shoulder tunic has a printed image of a pumpkin face on the front. The bright orange sweater features a wide neckline that slides below one of your shoulders for a sassy 80's look ideal for either lounging or partying. Ribbed wrist cuffs and hemline help to create a more fitted look. Please note, when ordering this product, you'll only receive the sweatshirt. The socks and gloves pictured are not included. Make your look even sweeter by adding some accessories. Black fishnet tights or leggings and a pair of high heels can take the Jill-o-lantern from day to night!